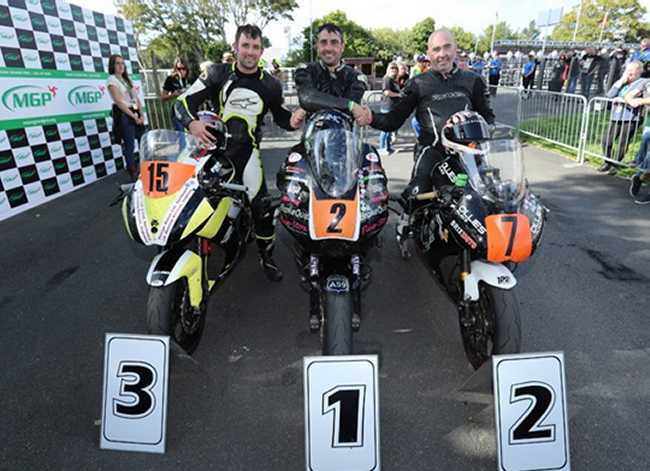 Preston’s Darren Cooper went one better by following up his runner-up place in this morning’s MGP Junior Race with his maiden Manx Grand Prix in this afternoon’s MGP Supporters Club Lightweight Race. With number 1 rider Jonathan Perry withdrawing with injury from a qualifying incident on his Senior machine last week, Cooper was first away from Glencrutchery Road in the third race of the 2017 Manx Grand Prix. Cooper was first on the road to Glen Helen but Andrew Farrell, the fastest qualifier, soon passed him on the clock to lead by just over a second with Marc Ironside less than half a second further back in third at the first timing point. Barry Lee Evans was almost two seconds off the podium places in fourth with Spain’s Victor Lopez Santos less than a second further back in fifth. Farrell’s opening lap of 113.498 gave him a 3.5 second lead from Cooper (113.170) with Barry Lee Evans (112.729) holding the final podium position. Gary Vines, riding a Yamaha two stroke was fourth in 112.369 with Jamie Williams (112.318) completing the top five. The race was building into an absolute thriller as the riders headed onto the mountain section on the second lap with less than a second separating race leader Farrell from second placed rider Cooper, who was clearly on a charge. Cooper duly moved into the lead by the Bungalow as the pair headed into the pits. Cooper’s second lap of 113.918 gave him a lead of over two seconds from Farrell with Barry Lee Evans holding third after his lap of 113.273 with Gary Vines running fourth after his second lap of 113.306 and Jamie Williams (112.479) completing the top five. With just over twenty seconds separating the top five riders it was clear that the pit stop would be crucial. And so it proved. Cooper was able to gain a further 3.4s in the pits on Farrell to lead by six seconds at Glen Helen on the third lap while third placed man Barry Lee Evans was timed at 51s, which increased the gap between him and the race leader to over 27 seconds. Gary Vines also had misfortune in the pits with a thirty second speeding penalty, which dropped him to ninth by Glen Helen on the third lap and out of podium contention. Spain’s Victor Lopez Santos took advantage to move into fourth just over two seconds behind Evans with Jamie Williams completed the top five a further six seconds behind the Spanish rider. Cooper extended his lead to almost ten seconds over Farrell going into the last lap after posting 109.599 to Farrell’s 109.008 on the third lap with Barry Lee Evans (107.499) holding third, well behind the race leaders but almost five seconds ahead of Lopez Santos. Nick Jefferies, the 1993 Formula one TT race winner, moved into the top five ahead of Williams who was losing time at Cronk Ny Mona and Williams subsequently came in to the pits at the end of the third lap for an unscheduled stop and retired in the pits. However, Darren Cooper was not experiencing any such misfortune and extended his lead to a decisive sixteen seconds at Ramsey as the leading pair headed for the mountain section for the last time. Gary Vines, after his pit lane penalty, retired at Braddan Bridge on his fourth lap when his two stroke machine expired while David Lumsden, who also received a thirty second penalty for a pit lane infringement, retired at Quarry Bends when running sixth. Cooper duly claimed the race win, eventually winning by almost thirty seconds in a time of 1:20.20.314/ 112.713 from Farrell (1:20.48.300/ 112.062) with Barry Lee Evans (1:21.03.841/ 11.704) clinching the final podium place. Victor Lopez-Santos (1:21.06.955/ 111.633) and Nick Jefferies (1:21.47.342/ 110.714) completed the top five. Scott Millar, who came off at Cruickshanks was taken by airmed to Nobles hospital complaining of pain in his shoulder, while Andy Fenton was taken by airmed to Nobles with possible fractures after his accident at Joeys. Trevor Mathewson and Kevin Murphy came together at Ramsey hairpin with Mathewson reported unhurt but Murphy transferred to Nobles with a shoulder injury and fractures. John Turner was taken by airmed to Nobles for further assessment after coming off his machine at Glen Helen while Nigel Rea, who came off at the Gooseneck, was unhurt.